For the second year in a row, the market saw very few large leases signed in the first half of the year. AAA Life, in a lease arranged by Investors Realty, leased 23,801 sq. ft. at North Park in the largest transaction so far this year and there were only seven other transactions larger than 10,000 sq. ft. year to date. Several larger transactions are in the pipeline and we think 2013 will see more transactions over 10,000 sq. ft. by year end than what was experienced in 2012. Brokers have reported being very busy, leading to generally good expectations for the mid-year report. The results came in below expectations. The number of transactions (minimum size of 1,000 sq. ft.) is up 34% during the first half of 2013 over the first half of 2012 but square footage transacted is down approximately 20%. The market experienced -52,780 sq. ft. of absorption during the first half of 2013 and slightly increased vacancy from 13.9% to 14.3% from prior year numbers. There was a nominal $0.14 psf increase in average asking rental rates, up to $17.88 psf, from one year prior. These less than stellar results are countered by optimism for the market. The Investors Realty Office Team is currently tracking 29 large office tenants seeking a total of 750,000 to 850,000 sq. ft. of space over the next 30 months. 23 of those users are expected to secure approximately 300,000 sq. ft. in the next 6 to 9 months with the balance being candidates for build-to-suits or projects in the design stage 18 to 30 months out. As noted, we had generally good expectations for the mid-year results and are somewhat deflated because, like everyone, we want to see continued recovery in the market and the economy. That said, while these mid-year results have more negative connotation than positive, we think it is fair to consider the results as indicative of a fairly stable market. With the size of our market, one large transaction can impact the vacancy rate, and the addition of one new building can increase the average asking rental rate, so it should not be surprising to see some lagging results when we have had a six month period with few large transactions. 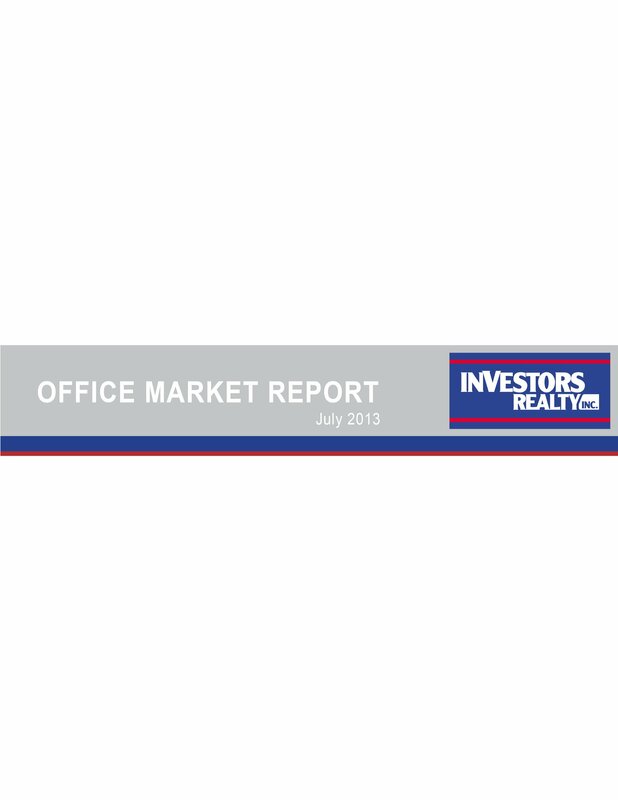 Our stable market appears to be tracking similar to the nation’s office markets taken as a whole. CCIM Quarterly Trends, which tracks 4.1 billion sq. ft. of office space, reports a nationwide flat office vacancy rate of 15.6% and predict this vacancy rate will continue through next year. Trends predict the nation’s office markets as a whole have seen and will continue to see positive but nominal absorption, 31,000,000 sq. ft. in 2013 and 42,000,000 sq. ft. in 2014 and small rent growth of 0.07% through the next six quarters. In the first half of 2013, we had -52,780 sq. ft. of absorption compared with positive absorption of 185,175 one year ago. As we have reported for several quarters, Class A continues to lead the market: Class A 39,645; Class B -40,870; Class C -51,555. Hopefully, the activity we are tracking moves ahead on schedule because there will be negative absorption pressure on our market in the second part of the year because the new 105,000 sq. ft. Westplex IV Building will be completed and added to the market. This is notable as it marks the completion of the first new speculative office building since the 2008 recession. Average Asking Rental Rates have increased in all classes in both downtown and suburban submarkets, although only nominally. Class A increased $0.16 psf to $24.63; Class B increased $0.09 psf to $18.63; Class C increased $0.37 psf to $13.93. We believe that the existence of an overall increase reflects landlord optimism for the market but the size of the increase suggests continued caution. Class C average asking rental rates have increased nearly 3% across the market and 17% downtown. This is a function of two buildings that were previously on the market but with “negotiable” prices that are now priced at nearly $16.00 per sq. ft. The overall Omaha office vacancy rate increased from 13.9% to 14.3% from one year ago but the real story is that the rate for Class A properties was down dramatically, from 9.2% to 4.7%. Meanwhile, both Class B increased from 13.2% to 15.5% and Class C increased from 22.9% to 25.8%. As we have reported, Class A has benefited over the last few years from the flight to quality and while owners of Class A office space are some of the most confident landlords in Omaha, such a low vacancy rate isn’t healthy for the market. If one seeks 10,000 sq. ft. of Class A office space in Omaha today, the choices are limited to less than 10 buildings. If the size requirement goes up to 20,000 sq. ft., the number of existing buildings drops to about four. Average asking rental rates for Class A space should increase notably this year and new construction will likely follow. Construction has remained fairly quiet. The only speculative construction is at Sterling Ridge at 132nd and Pacific Street where Lockwood Development has started construction on a 60,000 sq. ft. building and Millard Refrigerated just completed construction of their new 65,000 sq. ft. corporate headquarters. Gavilon, Gordman’s, and Tenaska are all underway with their new owner occupied corporate headquarter buildings. Both Deeb Realty and Prudential Ambassador Real Estate have their sites set on starting construction on new buildings for their own businesses along the West Dodge corridor, although plans are not yet firm. Bank of the West is out of space in their building at 136th and W. Dodge and will be expanding the building to accommodate.